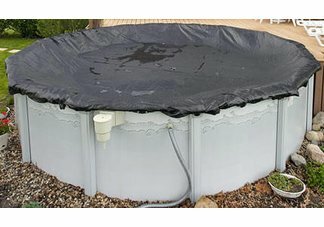 This rugged 22 x 44' mesh pool cover makes spring clean-up for your 18 x 40 pool a snap! The secret to this unique cover is the tightly woven scrim that holds together ensuring that no gaps or holes develop. Rugged mesh allows only rain water and very fine silt to pass through. Since the cover is made of mesh that is very lightweight, simply lift it off in the spring. There is no heavy water to lift off or time consuming cover pumping. Simply remove the rugged mesh, vacuum up the fine silt and open your pool! To return a product based upon the replacement/return guarantee of Pool Cover Source, you must call or e-mail our Returns Department and obtain a Return Merchandise Authorization ("RMA") number within the guarantee return period for the product (described above). Pool Cover Source will not accept returns without prior authorization and an RMA number. Once issued, RMA numbers are valid for 15 days in which must be returned to Pool Cover Source. RMA numbers will not be extended or reissued. Customer should prominently display the RMA number(s) on the shipping label of boxes containing the returned product. Customer is solely responsible for shipping any returned product to Pool Cover Source. Customer agrees to use only reputable carriers capable of providing proof of delivery and insurance for the entire value of the shipment. Customer agrees to bear all shipping charges and all risk of loss for the return product during shipment. Customer agrees that all returned products will be 100% complete, in re-saleable condition, and will include the original packaging material, manuals, blank warranty cards, and other accessories provided by the manufacturer. If any component of the returned product is missing, Pool Cover Source Return Procedure will be breached and Pool Cover Source will reject the entire return or may choose to impose additional charges against the customer for replacement of the missing component. Pool Cover Source will not refund to Customer the original shipping charges. In addition, Pool Cover Source charges a 30% re-stocking fee on all non-defective returns for refund. Products being returned for a refund, must be received by Pool Cover Source prior to 30 days from the original invoice date. Returns received after the 30 day return period will no longer be eligible for refund. 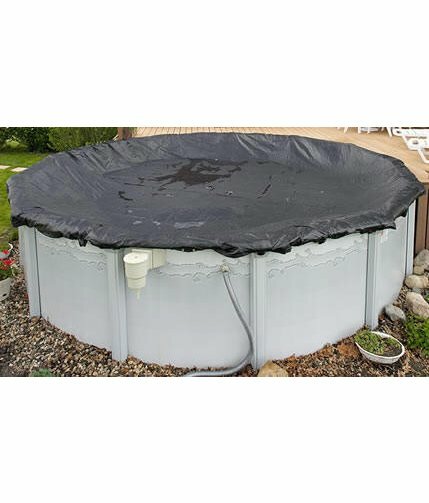 There are currently 0 reviews for the 18x40 Oval Mesh Winter Pool Cover.